These are not the largest splitting axes, but they make up for any lack of size with superior efficiency thanks to a proven Scandinavian design. With the rising popularity of wood burning stoves and outdoor fireplaces, many home owners are splitting their own firewood. In North America, mauls are a common tool for splitting wood. Weighing between 6-8 lbs., mauls are heavy to swing repeatedly and can produce a lot of shock, which may lead to fatigue. The other common tool is a felling axe, best suited for chopping. 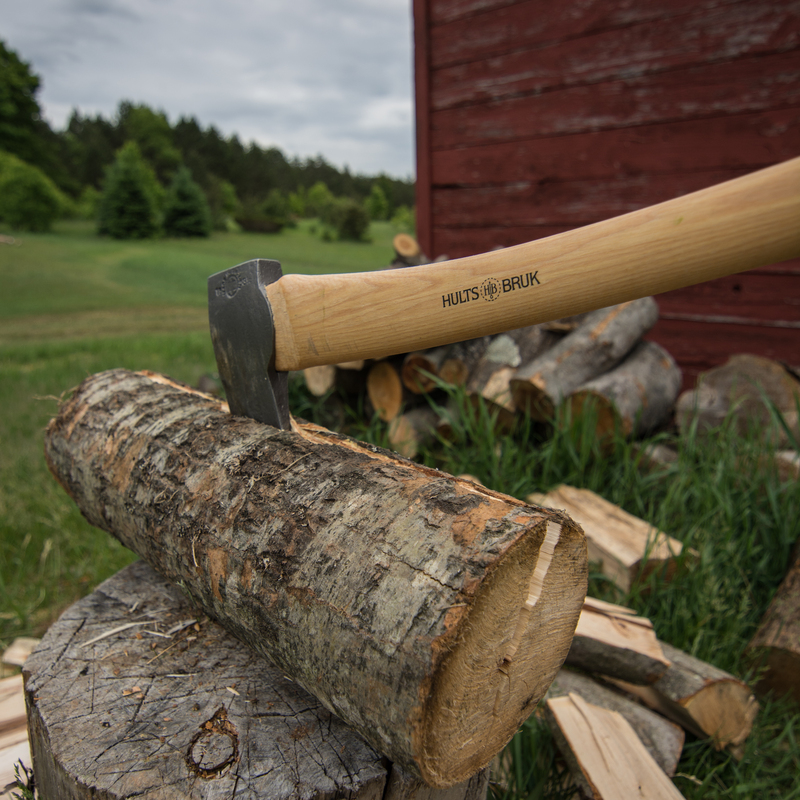 The lighter weight axe is easy to swing but the standard axe head shape often gets stuck when splitting wood. Purpose built for splitting, the Swedish splitting axe has a blade with a steeper angle than a felling axe. The long narrow head doesn’t stick while biting deeply into the wood. Along the cheeks is a pronounced metal spine that reduces friction, while providing additional wedging action that cracks wood open with explosive power. The Swedish splitting axe can also be used for an old method of splitting long logs horizontally and hitting directly into the bark. Using this method takes longer for the wood to dry. However, longer logs require less storage space when drying and the larger pieces are easier to transport through the forest. As part of Hults Bruk’s premium line of axes, the Sarek boasts a 3.5-pound, expertly hand-forged Swedish steel axe head left blackened by the fire and sharpened to a razor’s edge. The axe head is secured to a 30-inch long, straight shaped handle made from solid American hickory. 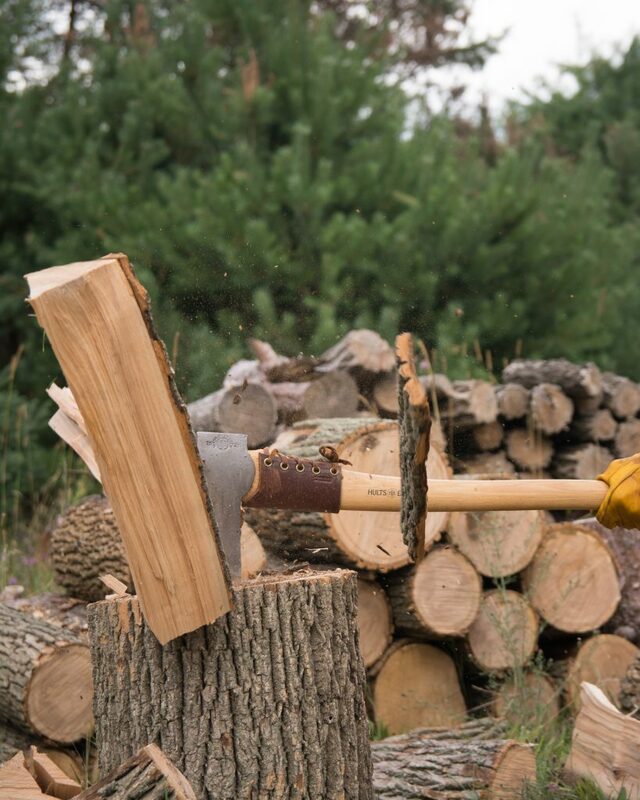 Our largest splitting axe is intended for heavier duties such as splitting large rounds. The weight of the 3.5 lb., hand forged axe head punches into rounds, while the thin edge and wide head shape effectively split the fibers of wood apart without having to cut through them. The long, 30-inch American hickory handle provides accurate, powerful swings. 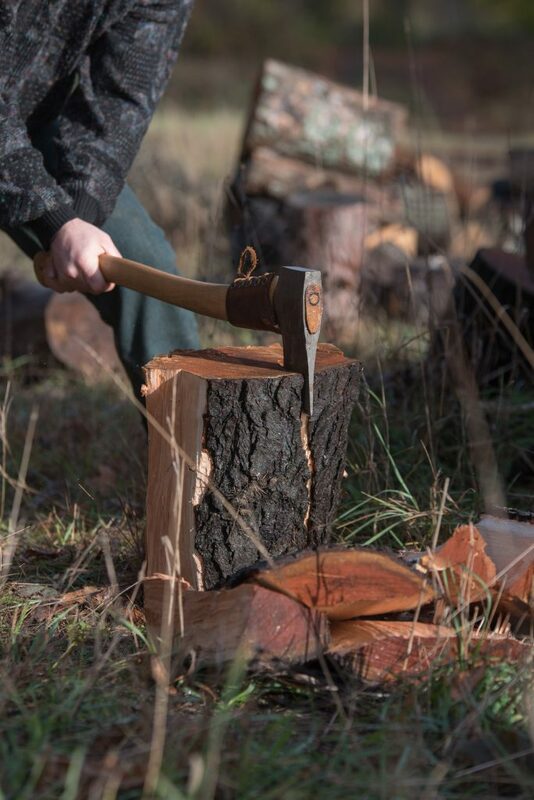 Our smallest splitting axe is intended for lighter splitting tasks, like firewood and kindling. The 2 lb., razor sharp axe head and 20-inch American hickory handle make it a great choice for those looking for packability on the trail or in the truck. Look for weaknesses in the wood and take advantage of existing cracks in the wood to help direct your first blow. Swing straight down toward the top of the block, using your body weight then give the axe handle a slight twist just as the bit hits the block. This helps pop the block of wood apart and prevents the axe from sticking. On a knotty block of wood start splitting from the outside edges, cutting off the sides. If the axe gets stuck in the block you are trying to split, the best way to remove it without damaging the axe is to tap the end of the handle sharply downward with the palm of your hand.